The PlayPal Plug & Play is a "console on a chip" manufactured by AtGames in 2006. It has twenty built-in Sega Master System and Sega Game Gear games. 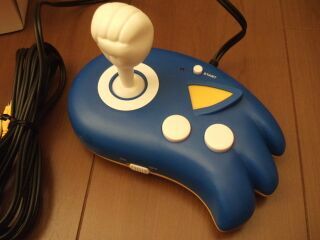 The console is shaped like the head of Sonic the Hedgehog and doubles up as a game controller, with two face buttons and a joystick shaped like Sonic's fist. This unusual design is unique to the PlayPal, though similar shells were also used for the Genesis Gencore and Fun Play 20-in-1. PlayPal Plug & Play, with box, manual and A/V lead. Early flyer with only 5 games advertised.